3 Beds 2 / 0 / 0 Baths 1,720 Sq. ft. Description: All brick sivage thomas home in fabulous los cerritos subdivision! One story, all freshly painted, 3 bedrooms and 2 full baths. Open, light & bright floorplan. Gas-log fireplace will keep you cozy on cold winter nights. Beautiful master bathroom with double vanity, jet tub, separate shower and a large linen closet. Over-sized 3-car garage with a 7 foot clearance and extended an additional 4 feet plus a convenient utility sink. All xeriscape landscaping. Refrigerated air conditioning will keep you cool all summer. 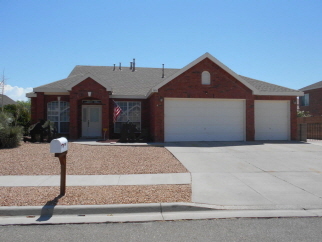 Easy access to i-25 & minutes to albuquerque. Convenient to shopping, walmart, schools, restaurants & theater.